2:20. Hi Wolf! Good Morning, all! 'Maen', of course. 1-&GT;9 works. Interesting stones. Winter finally arrived, I guess! I must be hungry or thinking about cooking, as the picture presented itself as a meatball cut in half ! I can work on my chicken and dumplings or beef stew today ! Do you think someone expected that boulder to be a geode? 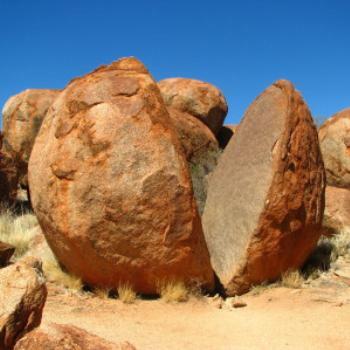 We saw sunrise and sunset at Uluru and also the Olgas, but never got to the Devil's Marbles. Evidently, you can camp there and the sunrise is as spectacular as at Uluru. I would love to do that! Good Maen, good people. I can't believe so many days have passed since I've commented. I've been checking in every couple days, reading comments then utterly failing at Postings. You all have been super busy. So have we. I have the new website almost ready to go live. Actually haven't done much this last 10 days but work on what's upcoming so I have solid content when the site goes public. Add in shoveling half of the 9-1/2'' of snow accumulation (6-1/2 '' yesterday), preparing for my various travels and getting the cat to the vet, 'ALL* I have left to do is financial figuring and form-filling. Looks like a cut open meatball to me, too. Funny how pets can overrule you!!! My son's cat, Nemmy (short for Nemesis) now is in her twentieth year, lives in my kitchen. I have the kitty pads out for her but she misses daily and I have to do the clean up. I think my floor is cleaner than before for all the multiple daily cleaning I do! Loved your cat tales, Plum! Hope your cat is doing better soon - even if she'd rather continue with the sardines! shosho - love the name Nemesis. I feel for you and your geriatric cat care. Shiela - how's your sometimes cat? Too cold to visit? Morning all,it would have to be a big devil to play with those marbles. Woke up to the sound of rain , had to check the radar for Bill as he wants to play golf. Love those big rocks today! Nicely taken photo, Wendy. Hi all... love cats and your cat story... hope all goes well for you both, Plum! Done shovelling, and more shovelling, and more more shovelling... and still snowing nonstop winds changing but steady strong... I'll be in bed early... my guess shovelling will be on early schedule tomorrow. Snow is starting to melt, did not get enough to make a big mess. I love snow when I don't have to go out in it. Peter, does Tara ever just get to be a dog? You know, run off leash, etc? A late hello - busy day moving that white stuff around; guess we were just making room for more, and more, and.... more - when will it quit? Is that a common term to everyone of only used here in the atates? My son lives at Miena in central Tasmania. A high risk bush fire warning has just been issued for the area. He is safe but we are worried about his house. Keep your fingers crossed folks. Peter, I hope your son, his family (if any), pets and house are law safe. How could anyone believe that there isn't such a thing as global warming? Joyce, wind chill factor is a term used by our weather guessers. Being close to snow fields means that it affects us fairly often. We also have hot winds (northerly and north westerlies that carry the winds down from the red centre. Holy moly I didn't notice it is page turning time. Well;l it is, so goodbye page !.